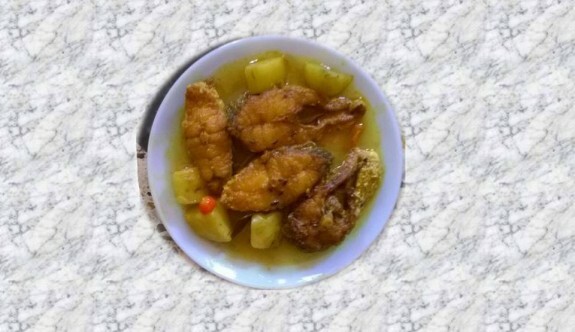 Bhetki fish is favourite fish not only for Bengalis but also for all the fish lovers. Simple bhetki dish can make a great taste in the recipe. So why not try Bhetki Macher Rasa /Bhetki Fish Rasa in your home? 1. Mix 1 tsp turmeric powder, ½ tsp salt with the Bhetki fish pieces. 2. Heat oil in a pan and fry the fish pieces until its light brown. 3. Keep the fish pieces in a plate. 1. In another pan, heat 2 tsp mustard oil. 2. Heat the oil and fry the potatoes until soft and light brown. 3. Keep the potatoes aside. 4. On the same oil, add bay leaf cumin seed and 1 red chilly. 5. Add the Cumin seed and coriander seed paste on the oil. Saute everything. 6. Add turmeric powder, salt, red chilly powder , chopped green chilies and sauté everything until everything cooked well and oil comes out from. 7. Add light warm water on the pan and make it light boil. 8. Add fried potato and fish pieces ad sauté it lightly. Be aware while cooking the fish that the fish pieces will not broke. 9. After 5 mins while everything will be cooked, add the garam masala powder and sauté it. 10. Remove it from heat and serve it hot with rice.